Minimising one’s carbon footprint is an essential tool to a better, healthier future. And yet, few people realise that the crux of planetary progression lies in the four walls of a classroom. Between turning off the extra lights and loading the washing machine to its fullest capacity, few of us manage to see that there can be a positive environmental impact beyond the mundane. Until now. Education technology can go a long way in keeping the world clean and green, with a scope spanning from kindergarten all the way to university. If you’re in the field of education and have often faced logistical and physical constraints while remodeling your class or expanding your classrooms, this article is for you. Here are 5 unique ways that you can augment your education offerings, and burn fewer carbon calories when you try to figure out how to sell education courses. Gone are the days of needing vast amounts of space to house a class full of students. With online universities and degree programmes, institutions have the option of deepening as well as broadening their reach without having to make any physical room while considering their options for how to sell education courses. Construction sites are among the leading contributors of pollution in the world, spurred on by vast amounts of diesel that are pumped into heavy machinery and equipment. The resultant dust is termed PM10, a substance that takes root deep inside the lungs, leading to ailments like bronchitis, asthma and sometimes, even cancer. Although more environmentally-friendly resources can be employed during construction, the fumes caused by machinery are inevitable. The solution? Virtualising classrooms by introducing online equivalents of classroom courses. Initially, you could introduce a new course to see how students adapt to an online environment. Once you gain acceptance, you could migrate your existing courses onto your virtual platform. You don’t need a great deal of technological expertise or a tech-savvy team to create an e-learning service for your institution. Not at all. In fact, there are dedicated turnkey frameworks tailored exclusively for ed tech platforms. All you have to do is buy and install, and you’re ready to go with your online learning software. 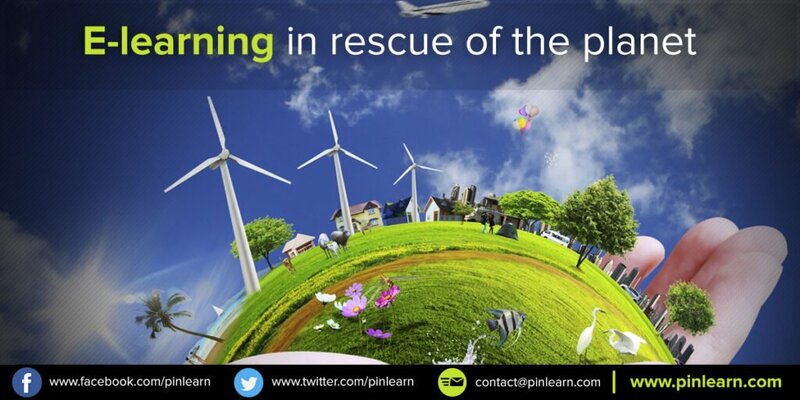 Pinlearn is one such service. It is equipped with an array of personalisation features and live streaming tools. An immersive platform that envelopes students in a Khan Academy-style experience, you get huge bang for your back. Traffic is nobody’s best friend. But the reality is, that the explosion of cars is doing more harm to us than we think. When pollution is compounded, it can become dangerous. By picking alternatives such as subways, trains and carpools, we can save multiple resources. Money, time, energy and gas are just some of them. The fewer cars on the road, the less the pollution. The rise of online universities can result in fewer traffic woes and increased quality of life with the right course management software. The next big problem? Industrial chemicals and solvents. These are usually used to scrub floors, but these substances can be highly toxic, with evidence indicating that there may be a link between industrial grade chemicals and infertility and respiratory problems. By letting students seek an education remotely, you’re contributing to better health levels with the right course management software. Vending machines are steadfast residents at most commercial venues. Theatres, leisure centres, spas. And of course, schools and universities. Not only are these glittery machines stocked with fatty, synthetic, unhealthy foods, their contents are wrapped in shiny packages that are often not biodegradable or reusable. The foils that are used to enfold the goodies that vending machines hold are made using a non-reversible process, meaning that once their purpose has been fulfilled, they are dumped in landslides whose levels rise day by day. A remote learning model or efficient online learning software ensures that students can learn from the comfort of their homes, eat homemade, quality food and steer clear of contributing to non-biodegradable waste. Most of us live in climates that require temperature moderation through heating and cooling. Imagine, though, how much energy a large institution would need to shield its students from harsh climates. A large edifice is far less energy-conserving than an average home, guzzling fossil fuels galore, just to maintain a steady temperature indoors. Even if you draw an analogy between eLearners and on-campus students, in terms of per capita energy consumption, you’ll find that eLearners use far less energy, even if they live in a household comprising other members. The collective household energy expenditure of online learners is still far behind the total energy expended at a physical university. By conducting classes online, you’re favoring pixels over paper. A recent research suggests that 300 million tonnes of paper are produced annually, of which most is channeled to schools and offices. Rewind back to your school days, and you’ll remember that homework and handouts were all paper-centric. Add to that, the vast volumes of paper used by the teacher, as guidance notes, attendance registers, review guides and report cards. By transitioning to an online learning software tool like Pinlearn, you’re automatically removing the need for paper-based notes. Instead, you can email your students their progress periodically, and maintain notes and coursework on a digital cloud, for students to access anytime. Although sceptics may cite paper recycling as a plausible solution to the paper problem, you must remember that paper fibres are not curable after seven rounds of recycling, warranting the addition of wood pulp to make these materials recyclable again. The on-demand age that we live in is bridging distances, and proving that connectivity is a state of mind. Through avant-garde tools like Pinlearn, a growing tribe of e-learning platforms is emerging, converting more traditional learners into digital denizens. If your educational offerings are restricted to a physical format, now is the time to make the move; for you and the environment.